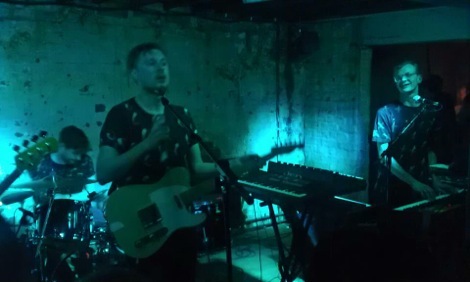 Django Django returned to Manchester with a new album under their belts and Getintothis’ Kevin Barrett was there to see how it went down. 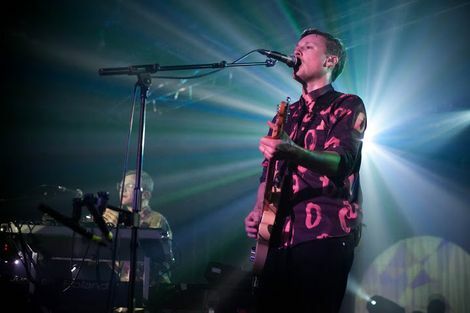 Dropping in tonight at Manchester’s O2 Ritz, stop number 18 of a 22 date European tour, followed with a stint in the US are the Edinburgh College of Art-formed, now London-based quartet Django Django. The band are currently in full flow and hitting the live trail with a magnitude of gusto. 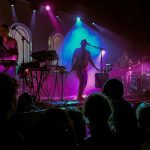 Already booked in for a series of festivals this summer including Womad, Bestival & Festival Number 6, there seems to be no let up from them in delivering their latest collection of pleasures from recent album Marble Skies to the masses. Spying a glimpse of the set list beforehand was a welcome sight knowing a full catalogue of the band’s spoils were on the agenda for the evening’s performance. 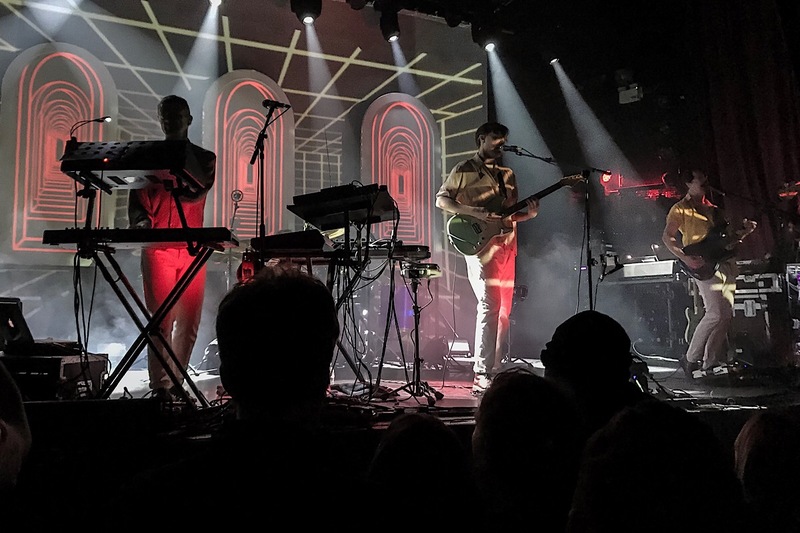 Django Django have evidently shown an array of musical diversity within each of their previous two albums; the Mercury Prize-nominated eponymous debut, and the 2015 follow-up Born Under Saturn. 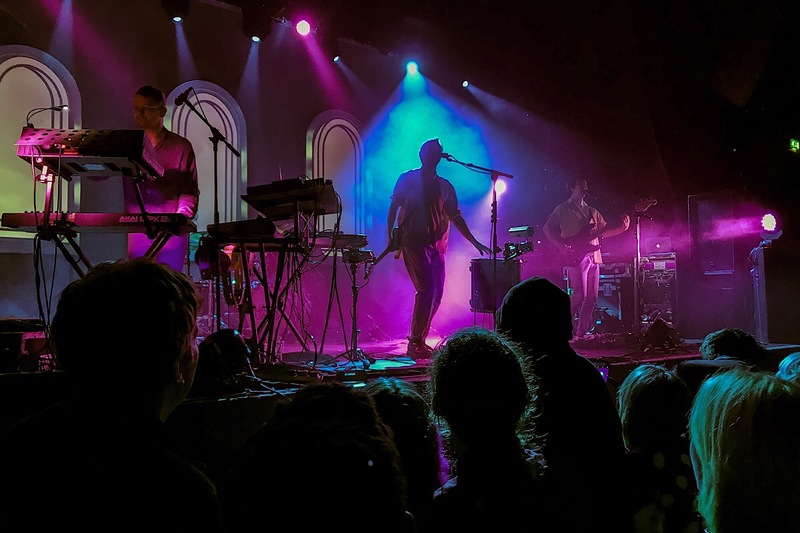 The latest and probably most daring release to date takes the band in a whole new, but equally exciting direction breaking away from the much-overused indie band tag. 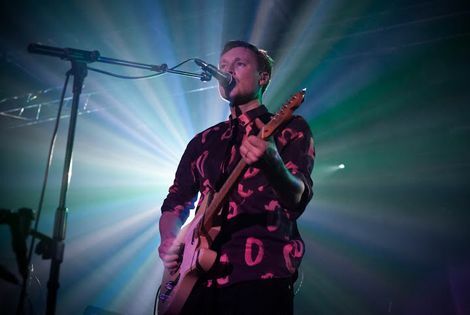 Taking to the stage the four-piece wasted no time in hitting the ground running with a punchy rendition of the new albums title track, front man Vincent Neff coinciding guitar and vocal duties with drum showmanship and proved an instant delight to this Manchester crowd. 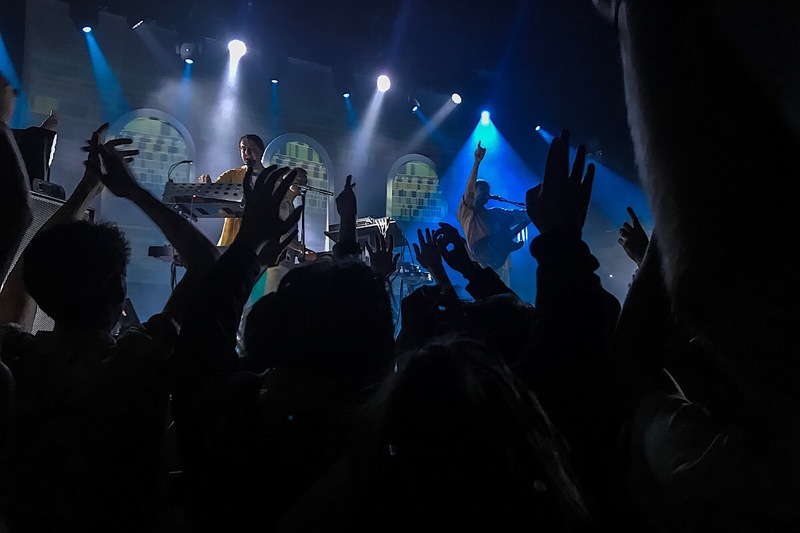 A couple of seamless transitions, and not a drop in intensity between Shake & Tremble through to the pleasing pop rockabilly-esque single Tic Tac Toe had the whole place jumping to the electro-infused beat. Pausing for breath Neff addressed the audience: ‘It’s been 3 years since we last played Manchester, it’s amazing to be back’, the crowd loving the tip and were loud enough to show their appreciation right back. This then led to Neff bringing to the stage tonight’s chief support, and former Slow Club singer Rebecca Taylor, now under the guise of Self Esteem to deliver a pitch-perfect Surface to Air as she has for the album collaboration. 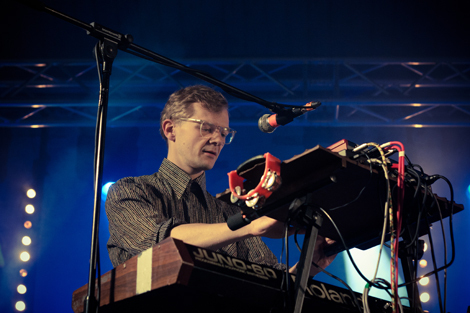 This synth-pop track is nothing like what Django Django have done before and will appeal to a much wider demographic. Watching the foursome it’s clear to see that this is a band that enjoys playing and experimenting on a live stage. Chopping through a host of hits including Waves, and In Your Beat the synth and percussion frenzy was a delight to witness. Next up, and for the first and only time of the evening the pace was slowed to exhibit Neff’s sublime vocal and evidently the band’s song-writing prowess on the catchy pop ballad Sundials. 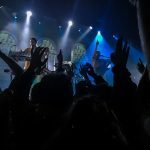 Calls of ‘Come on!’ and ‘Let me see your hands’ were a clear indication the slower vibe wouldn’t last long, and these requests didn’t fall on deaf ears, as Default kicked in and an elated audience and notably the huge mosh pit duly obliged. The Ritz had now erupted into to an all-out carnival affair through Life’s a Beach before climaxing under the baking red stage lights for Wor. A short wait for the encore of Storm, Champagne, and finally signing off with Silver Rays gave this audience a night to remember for a long time to come, and probably as good as time as any for the venue to get its foundations checked out. For anyone heading out on the festival circuit this summer catching this band is a must, and on this performance alone they are fully justifying their status of having the larger font size on the posters. 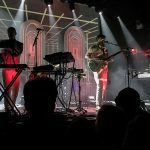 Rounding up with tonight’s support acts seen first to the stage; Man of Moon, a capable guitar and drum duo bouncing off each other with some catchy electronic hooks. Following them was the aforesaid Self Esteem. It should be noted that Rebecca Taylor has a stunning voice that showered the arriving crowd with a beautiful acapella, and with her backing singers, delightfully melodic harmonies, a somewhat juxtaposition to what succeeded but not displeasing in any way.